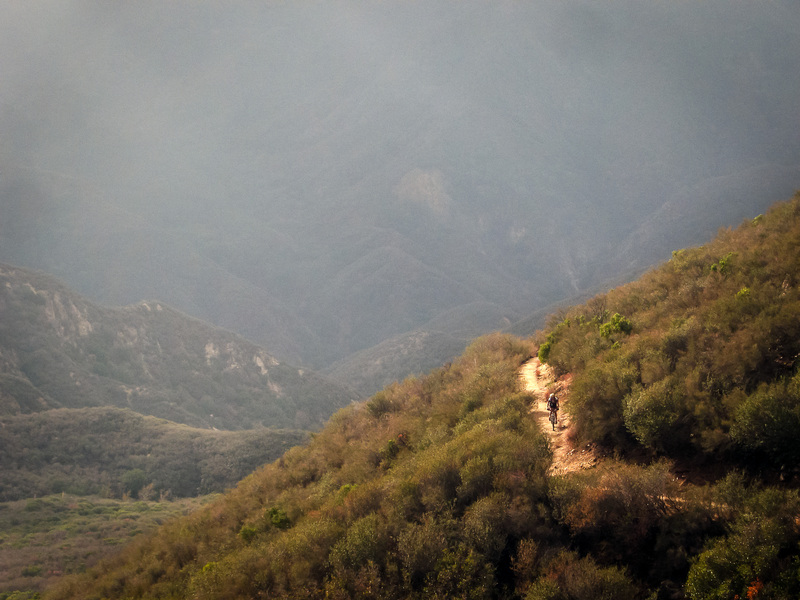 As previously reported, CORBA has been working with several other groups to get assurances that our needs will be met when and if the San Gabriels are declared a National Monument. 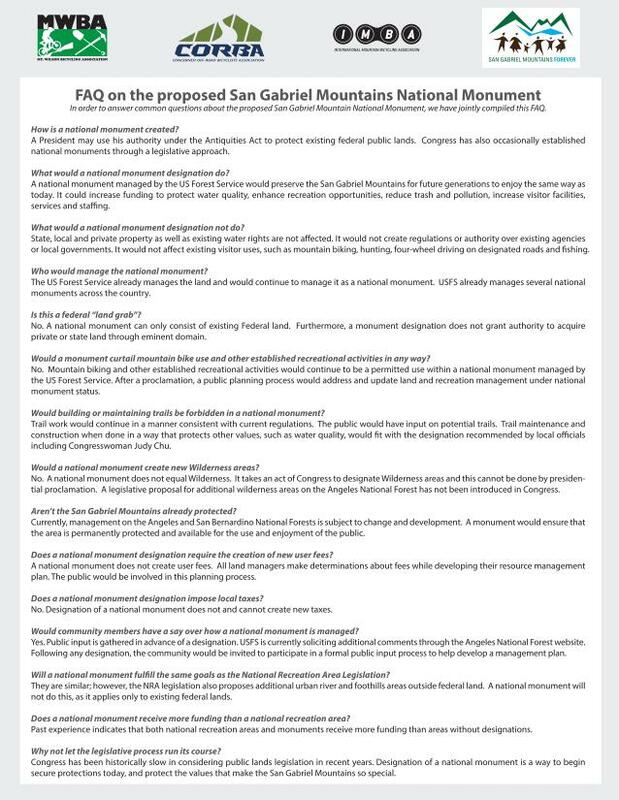 As we’ve received answers to many of those questions, the answers have been compiled into a set of frequently asked questions, or “FAQ’s” about the National Monument. 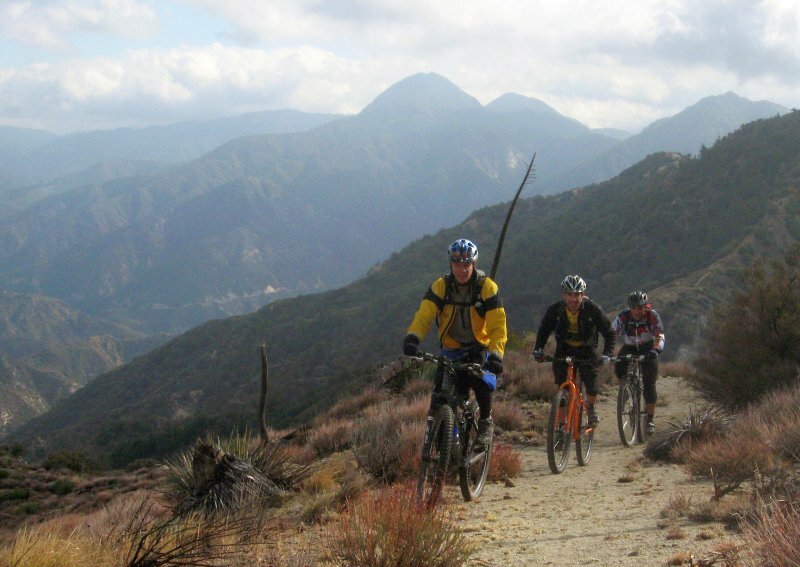 We’ve also seen correspondence from members of congress that support our position for continued bicycle access, along with all other forms of recreation currently allowed in the Angeles National Forest. We’re confident that under a National Monument, we’ll be able to continue riding the trails and volunteering to maintain them as we do now. This is a vision for the San Gabriel Mountains that we can support. That said, we must say that our support is tentative, and conditional on the final language of the proclamation and its accompanying preamble reflecting these recreational goals and ideals. We have not yet seen that final language, nor received any direct confirmation of the contents of the proclamation. While verbal assurances are helpful, until it is finalized and in writing, we feel it’s too early to proclaim our outright support. We have co-authored a letter that outlines a vision of a National Monument that we can and will support. We’re hopeful that letter has been given due consideration. Today the Los Angeles Times published an opinion piece that closely reflects our position. They support the designation, but do so with skepticism of the proponents’ claims that this will make all the trash, graffiti, and lack of maintenance go away. The only thing that will make these things go away is funding for the additional staff, rangers, education, law enforcement, and maintenance crews needed to manage the forest. While a National Monument greatly increases the opportunities for more funding and staff, it comes with no outright guarantee. News has just been released that President Obama may declare the National Monument as soon as this Friday, two days from now. For us and many others, this is a far too hasty response. If the proclamation is as we have been led to expect–acknowledging the value and importance of continued recreational access including bicycles–then we should have no problem. But we fail to see the need to push this through less than two months after the public learned of this proposal, and six weeks after the one and only “public meeting” (in which the public were not able to speak). At that meeting, even members of the invited panel of speakers raised questions that as yet, remain unanswered. Both San Bernardino and Los Angeles Counties have come out against the Monument proposal, in part because of a lack of public outreach and answers as to how this will really impact their constituents. We’d have prefered a slower approach with more public participation. There are many individuals and organizations adamantly opposed to the Monument. If allowed to voice their concerns and have them addressed and answered, some of that opposition would be reduced. As it is, this rushed process is just fueling their anger and outrage at a lack of public outreach. However, we remain hopeful and confident that any impending announcement will be favorable to mountain bikes. 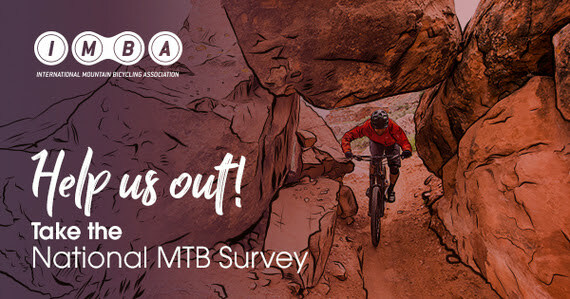 The following FAQ’s are a summary of the questions and answers we’ve compiled in collaboration with IMBA, Mount Wilson Bicycling Association, San Gabriel Mountains Forever, The Wilderness Society, and the Conservation Land Trust. With these questions answered, and the assurances from multiple sources (in lieu of the final proclamation language) of our continued access, we are giving our conditional support to the proposal. 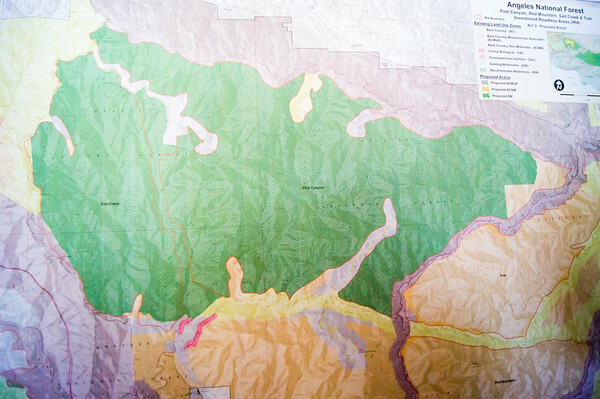 In response to a lawsuit, the four Southern California Forests are proposing amendments to their 2006 plans. They are proposing new Backcountry Non Motorized Recreation zones as well as new Recommended Wilderness designations. 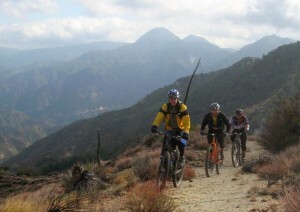 Several mountain bikers attended the informational workshop at the Angeles National Forest Headquarters on May 30, along with concerned forest users, and many from groups like the Sierra Club, The Wilderness Society and others. 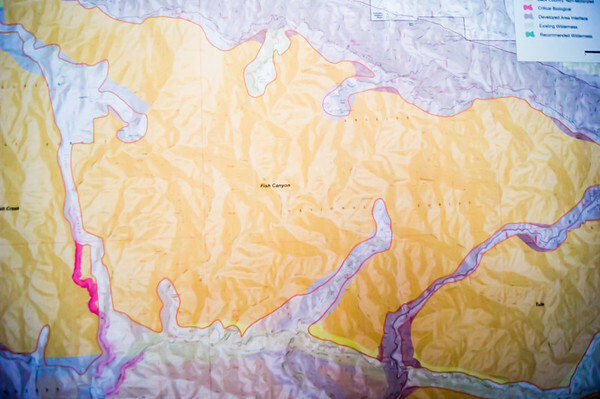 In the Angeles National Forest there is a recommended Salt Canyon, Fish Creek roadless areas were combined to create a 40,000 acre Recommended Fish Creek Wilderness in an area that was Backcountry Non-Motorized. It is now Forest Service policy that a Recommended Wilderness designation will be managed as if it were wilderness and the area will be closed to bikes. Concerns have been raised about the status of several significant nearby trails that bicyclists ride. We’re happy to report that the Golden Eagle Trail and the Warm Springs/Elderberry Forebay/Fish Canyon fire road Loop are unaffected by this proposal. 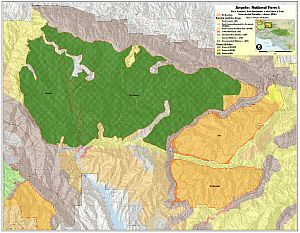 Wilderness boundaries have been drawn with “cherry stems,” areas of non-wilderness along the existing fire road corridors. the same has been done for the Burnt Peak fire road. We do have concerns about the Fish Canyon Trail (1GW05) and the Burnt Peak Trail (1GW02). These run generally north-south right in the middle of what would be the new Wilderness. We heard from several people that these trails may be overgrown and quite deteriorated. We need to know if riders have ridden them and are currently riding them. 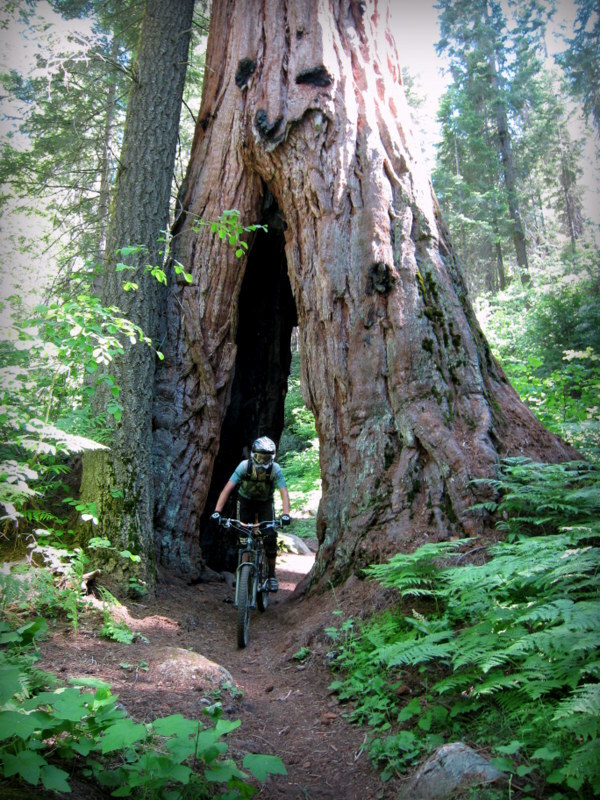 Despite their current condition, if they go into Wilderness, bikes will be excluded and the trails will likely never be restored due to Wilderness Trail maintenance issues. We might lose a significant future opportunity for a ride in a wild landscape. If you have information about these trails, let Steve Messer (steve@corbamtb.com) and Jim Hasenauer (imbajim@aol.com) know. There are also many changes including Recommended Wilderness Proposals in the Cleveland National Forest, the Los Padres National Forest, and the San Bernadino National Forest. Unfortunately for those who visit all four forests, only the Angeles National Forest proposed management plan revisions were available for review at last night’s event. If you are concerned about changes in other forests, it will be necessary to meetings. 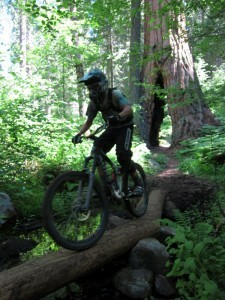 Mountain bike advocates are monitoring the meetings and will soon have talking points for your comments. The deadline for comments is June 11, 2012. CORBA”s first comment is that the online data supplied is not of sufficient detail or quality to make informed decisions about any new proposed changes in the management plans for the forests. Without real data that we can zoom in on (digitally) and use with the mapping and GIS tools with which we’re familiar, it is impossible to see what areas and trails may be affected in the detail needed to make informed comments. We’d like to see KML or Shapefiles that can be used with the most popular mapping tools for this, and any future NEPA or CEQA documents. 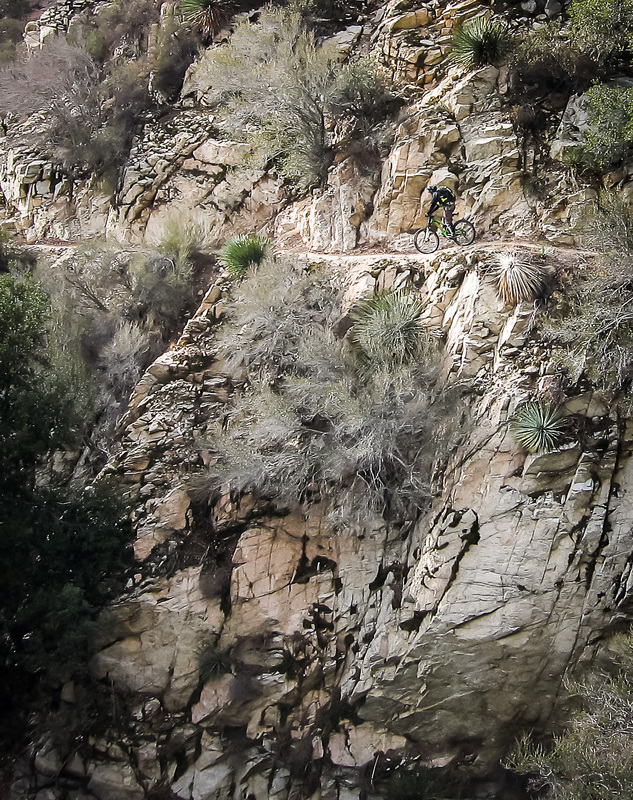 Though we don’t know the current state or conditions of the Fish Canyon and Burnt Peak singletracks, we would like to see the boundaries adjusted to allow continued bicycle access to these trails. We’ll formulate our final comments after we gather more information on these and other affected trails. Deadline for comments in June 11. • May 31,2012,4:00 PM to 7:00PM, San Bernardino National Forest Headquarters, 602 S. Tippecanoe Ave., San Bernardino, CA 92408. Outside Online, the online companion site to Outside Magazine, recently published online an excellent article about the ban on Bikes in Wilderness areas. The article originally appeared in print in March. Echoing the arguments put forth by IMBA, CORBA and mountain bike groups across the country, the article lays out the reasons that lifting the ban could lead to more land being protected. 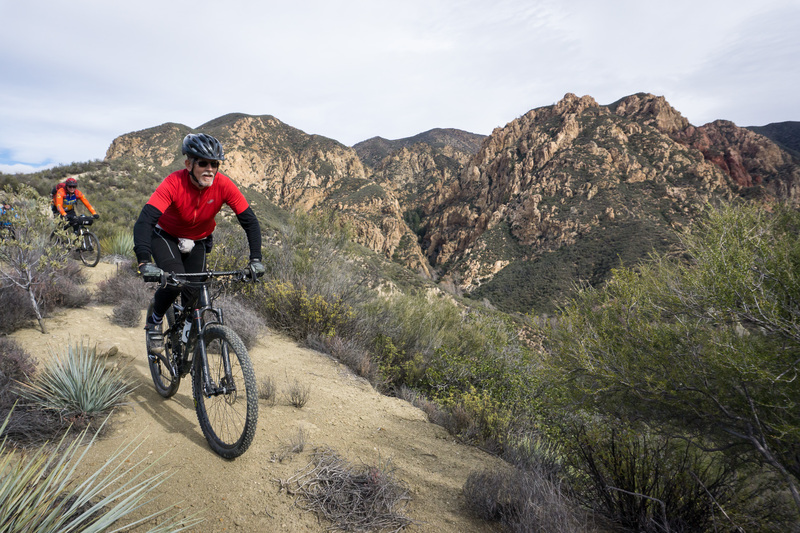 If wilderness did not exclude bicycles, millions of mountain biking Americans would join with environmentalists to support new wilderness designations. 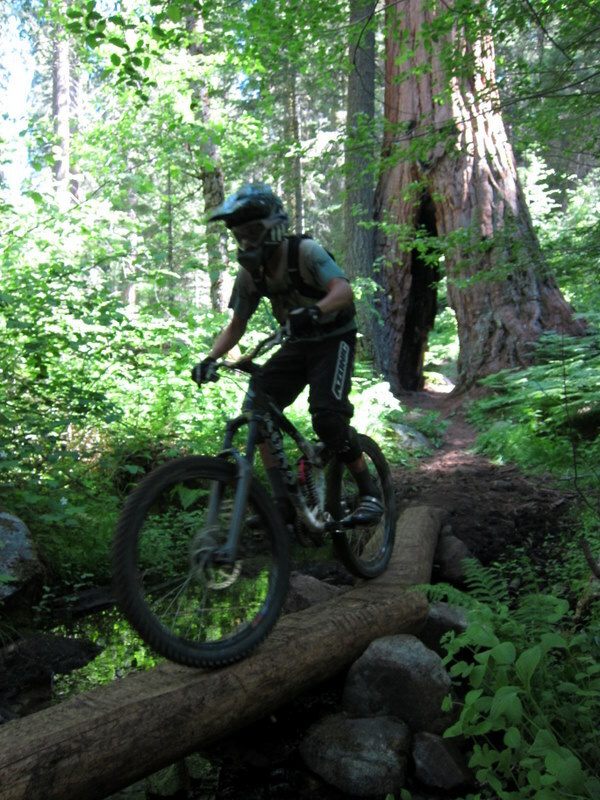 IMBA is working with agencies at the Federal and local level to incorporate alternate designations that allow mountain biking while still offering similar environmental protection. You can read the article on Outside Online, or see the full text of the article is after the break.